If you have been following the Building Conversations blog for awhile, you may remember Alison Nash, one of our Sustainability Working Group leaders. 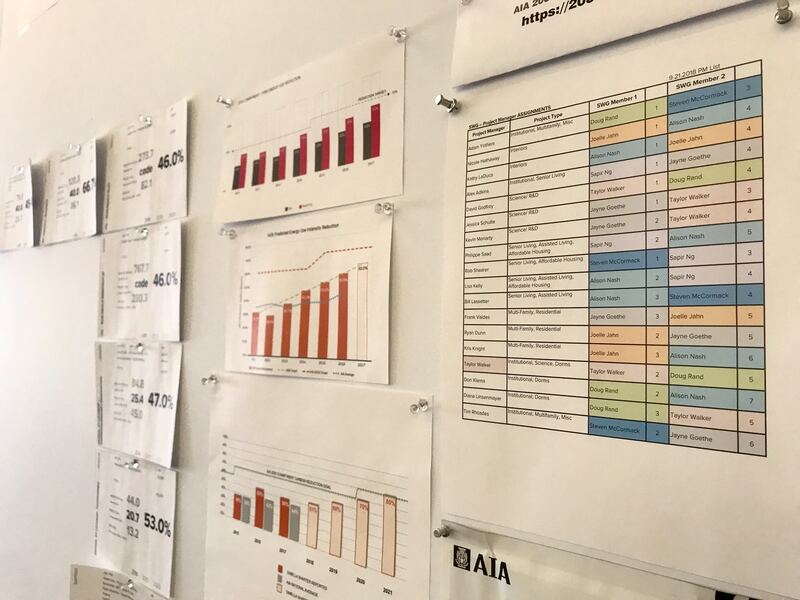 Since her guest post almost three years ago when the firm signed the AIA’s 2030 Commitment, the Sustainability Working Group has made waves in how we deliver data-driven, sustainable buildings to our clients. As we begin a new year, Alison is back to update us on the Sustainability Group’s progress and our new goals for the firm. New year, a fresh outlook, and time to set actionable goals. The mission of the AIA 2030 Commitment is to shift design practice towards the creation of carbon-neutral buildings, both new construction, renovations, and interior lighting. We are one year away from another 10% reduction step in predicted EUI in the Commitment, ratcheting up from 70% to 80% reduction from the 2003 baseline. This year, our Sustainability Team at DiMella Shaffer is launching several initiatives with one goal in mind– to achieve our own 10% improvement for our project portfolio every year for the next three years. For the past few reporting cycles, we’ve been diligent about reporting. For 2019, we will begin by establishing goals and updating project records throughout the year to more pro-actively support projects and act less reactively as the “sustainability police”. The firm has always designed with a focus on sustainability and has achieved close to the 70% reduction goal on some projects. However, these few projects aren’t enough to pull up our overall progress. Our 2030 Commitment challenges us to deliver energy reductions on every single project in our portfolio. This year, our primary goal is to have every project team set an internal goal for energy performance using the Research tool in DDx and the Zero Tool (or Lab 21) to establish a baseline. We plan on reporting to firm leadership mid-year how we are progressing towards increasing our reduction during 2019. The Sustainability Working Group started this initiative by holding Open Office hours during a monthly lunch for project managers to check in to ask questions, set goals, and complete their 2018 project reporting. So far, this tactic has been a successful forum to gather information from teams about challenges they are experiencing on projects, and to learn what types of information, resources, and knowledge is needed for teams to consistently deliver lower energy results for every project. We plan to continue on a quarterly basis after the March 31 reporting deadline to confirm that all project teams have set an energy reduction target. As we learn from project teams during these meetings how they are progressing towards their goals, we hope to learn what is working, adjust our tactics if needed, and set incentives or “carrot sticks” that help us assist teams in making project decisions that enable our firm to demonstrate progress towards our carbon reduction goals. By focusing on energy reduction, we align our practice with what our clients’ value – performance- and increase our literacy in how to design for efficient buildings within our clients’ project budgets. 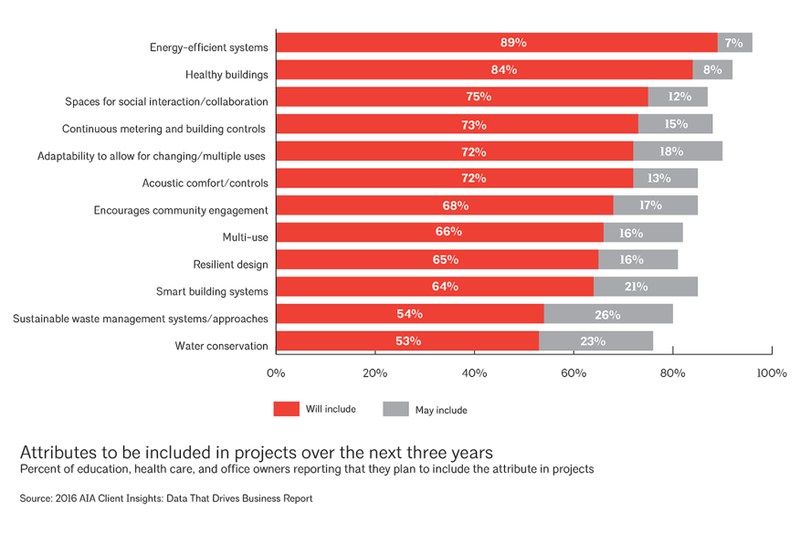 In the “2016 AIA Client Insights: Data that Drives Business Report,” client-owners stated that they are looking for energy-efficient systems, often including continuous energy metering and building controls. The second step in our progress towards setting internal goals for every project is to make each project teams’ goals visible in our office. To start we’ve created a moveable “bulletin board” with an index card for each project. Like everything we do, we will talk about whether this approach is successful, and work to improve it as we learn from each other and collectively create.